Chicago, Illinois - Rev. 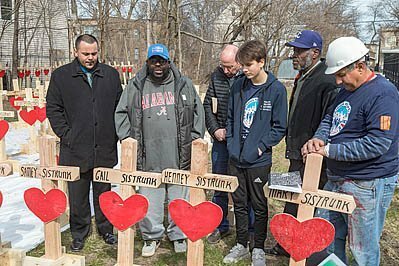 Donovan Price (second from left) prays at a memorial remembering the seven relatives that Ziff Sistrunk (second from right) has lost to violence since 1972. Other crosses on the vacant lot in Chicago's Englewood neighborhood represent those killed by guns in the city during the first three months of 2018. Chicago recorded 781 murders in 2016 and 664 in 2017. Image Description: Chicago, Illinois - Rev. Donovan Price (second from left) prays at a memorial remembering the seven relatives that Ziff Sistrunk (second from right) has lost to violence since 1972. Other crosses on the vacant lot in Chicago's Englewood neighborhood represent those killed by guns in the city during the first three months of 2018. Chicago recorded 781 murders in 2016 and 664 in 2017.